Lord Krishna is one of the most venerated incarnations in the Hindu religion. It is said that Lord Krishna is the incarnation of Lord Vishnu. Lord Krishna was born about five thousand years ago at the end of the Dwapur Yuga, the third cosmic phase and the beginning of Kali Yuga, the present and the last cosmic phase. Lord Krishna was born in Mathura city in the present state of Uttar Pradesh in India. He was born at midnight, hence the festival is celebrated for two days. The first day is called Krishnashtami and the second day is called Kalashtami. The Janmashtami celebrations of Vrindavan and Mathura, where Lord Krishna spent his childhood years, are the most famous and vivid. Lord Krishna's birth circumstances are extraordinarily unusual and in fact seem to be a miracle. The King of Mathura, Kansa, was an evil king. Kansa was the maternal uncle of Lord Krishna. His sister Devaki was married to Vasudeva. It was a divine prophecy that the eighth child of Devaki would spell death for King Kansa. Once Kansa came to know of this, he imprisoned his sister Devaki and brother-in-law Vasudeva. One by one, seven children were born to Devaki and were subsequently killed by Kansa. But when the eighth child "Krishna" was born, there was divine interference to save his life. At the time of Lord Krishna's birth the guards guarding the prison cell fell into a deep slumber due to which they were unaware of the birth of the eighth child. A divine voice commanded Vasudeva to take this newborn child to a place called Gokul and exchange this child with the newborn child of Yashoda and Nanda. Due to the divine interference all the shackles and the prison gates, opened on their own. Vasudeva then carried his newborn child Krishna in a wicker basket through the waters of the Yamuna River. Though the Yamuna waters were raging at the time due to a fierce storm, it parted to allow Vasudeva to pass and carry Krishna to safety. After exchanging the children, Vasudeva returned to the prison with Yashoda's and Nanda's child. The prison gates and shackles now fastened on their own and the guards awoke. When Kansa was informed of the birth of the eighth child, he came and picked up the child and with a view to kill hurled the child at the wall but instead the child took the aerial route in the form of a Goddess who laughed at him and told him that the eighth child who will spell the death knell for him had been born and was safe elsewhere. This Goddess was Yogmaya. At a later date, this prophecy proved true when Lord Krishna killed Kansa. 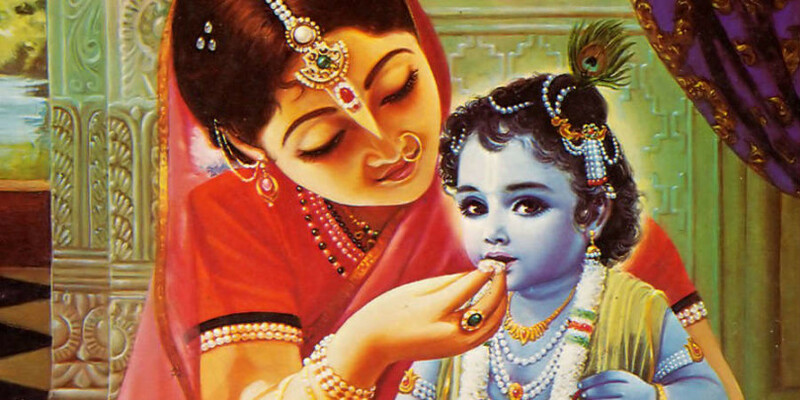 Lord Krishna was very fond of butter as a child, hence, he is also known as "Maakhan (Butter) Chor" (thief). He used to steal butter from villagers accompanied by his friends. On this day, devotees keep day long fasts and chant bhajans (religious hymns) till midnight when Lord Krishna was born, followed by prayers. This ritual is followed in the cities of Mumbai, Pune, Dwarka, Vrindavan and Mathura. 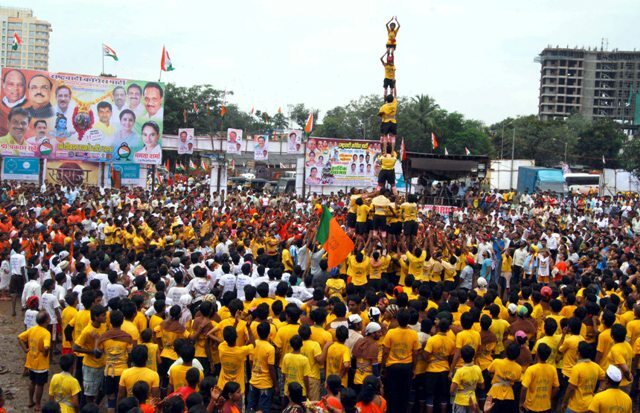 In Mumbai & Pune, this ritual is also called dahi handi and is celebrated with a lot of energy and vigour. Handi means a clay pot and dahi means buttermilk. So, a claypot is filled with buttermilk and tied high up. Young boys form a human pyramid. The boy on top of the pyramid is supposed to break the handi with a coconut, as a coconut is considered to be a pure object. Prizes in cash and kind are also offered by local communities to those who break these handis.